Post your impressions from this exercise in the comments section below! Then read on to see what others received! Danielle MacKinnon has been named an expert TV psychic medium, intuitive, animal communicator, and foremost expert on soul contracts. She has been nationally recognized in the book Top 100 Psychics and Astrologers in America (2014), by Paulette Cooper and Paul Noble. Danielle has appeared on numerous radio shows, tv and taught along side some of the world’s most renowned psychics, mediums, healers and TV experts. She has facilitated popular seminars in animal communication, soul contracts, and the intuitive senses throughout the country. Danielle’s book, Soul Contracts: Find Harmony and Unlock Your Brilliance, continues to assist thousands of people in breaking through their blocks to discover happiness within. In the picture we see the shadow on the floor of the Dog, BUT, there is another shadow under the dogs one and it seem’s that this shadow has no dog ! It does look like another dog’s shadow. This photo makes my left wrist feel stiff & my palms tingle. Is that a yellow button the dog found? Good job Julie! This dog has some “wrist” arthritis. 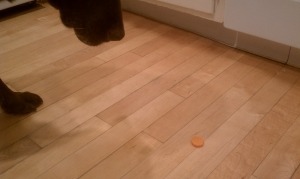 A slice of a carrot fell on the floor & pup is investigating. You were slicing carrots, one fell on the floor. Dog is checking it out. I get carrot. I make soup often and my dog loves it when I do for I “ooops” drop a carrot on the ground. The dogs think it is a treat, not knowing it is a fat free treat! So I’m going with someone is cooking and a carrot just happened to drop. The “What the ? !” comes from the fact that the carrot was VERY hot and all she wanted to do was eat it. your labrador retreiver is asking permission by longingly looking at the slice of carrot on the floor…what a polite pup…! Could hear/see a couple (45-60) and their son (20-30) who is a grown man laughing over this. The son was holding a box of cheese crackers and they were talking about how the dog loved cheese crackers. The name Old Duke came to me for the dog. the button fell, startled him, but he is curious and waiting to grab it. Nice Laura! This is exactly what she was doing – not because of a shadow dog – but because it was hot and this was not what she wanted! Its my prize for being a good dog. I can concentrate. I CAN DO IT< I CAN! Its hard to "behave" the way humans want me to sometimes. I wiggle when I wag my tail. “It’s hard to behave” is something that this dog has said to many communicators. I too would like the facts…. otherwise we never know if it is a hit or miss….and i notice people go on a tangent…are we feeding off each other in the wrong direction or are we all just picking up the same thing? anyway-i like playing and thanks for these challenges to just let it rip! I see people making a salad and the dog will eat the carrot that fell on the floor but is really a big lettuce fan and waiting for some of that. Good job! It’s actually kale that she is waiting for – but it would be very difficult to differentiate between the two in your head. I fell the dog is focused on the shadow moving on the floor. Looks to me like two shadows . One is def the dogs but the other one looks lighter like light coming from another direction as if there is a hand playing wth the dog and is teasing him about wanting to eat the dog cracker but …. Where the hand puppet shadow if you will is and the dogs shadow meet there is also in the light an outline of a fox head . I feel it’s a carrot slice. I see the other animal’ shadow also. Could b a fox, but I feel racoon playing. The shadow is me taking the photo! Hard to tell what that is — but the dog is very focused on it, so it has to be food. Maybe a cracker or a piece of carrot. The dog felt male and older but still very frisky and curious. Seemed like the owner had trained him to wait until he was given the command to take the treat. And, the dog was waiting for the command. I’m getting a name Sam. Very active lifestyle and lots of outdoor activities. Happy. There feels like there is another dog in the family. I feel like the orange dot is a piece of a carrot. I think its almost a steamed or hot piece of carrot. my hands are tingling like i put them in a pot of boiling water. The dog wants to eat it but he/she is barking or yipping at it because its too hot. Im getting the name Lucy or Lani? I believe thats the dogs name. Rolaid or antacid? Someone was ready to eat it and then dropped it. The dog sees his shadow and is fascinated by it…the round object does not capture his/her interest. I asked and the word carrot popped into my head. I think he is thinking it is food but I am not sure if I am supposed to eat it. Am I allowed to eat it? Will it taste funny? Is it something that I will like to eat? I heard ~WAIT! A woman said wait, treat – chip? lets go outside? Looks like a mini ritz cracker and the dog looking at it trying to figure out if its something he can eat. It is a game piece. This dog is waiting for permission to investigate. The round object on the floor is a half of a mini Ritz cracker sandwich that someone dropped, or even a yellow button that fell off of a sweater – what ever was dropped was done by someone in a careless hurry, but it is not the dog’s main focus. I sense the dog is apprehensive, or cautious about something in the room he doesn’t understand. There is a shadow from someone or something else being cast down over him and on the floor, and it’s something he’s not familiar with. I feel curious. Left hand tingles…feeling heat…surprise…anticipation. The shadow of the photographer feels like a pixie. I taste sweet root. Something annoying about the left hand thingy as if it is just a tad limiting but yet not life threatening. I am always curious about anything like this animal. I approach, observe, try to analyze using my sens than I integrate it. A dog is checking out a sweet. The dog is curious but apprehensive. The disc has been slid air hockey style. Dog is confsed. Yellow…TREAT! No?? Hmmm. First impression a bit odd, but there it is. The dog must have been exited, and then quickly confused. The dog is curious about what is on the floor. It could be anything but the dog is hungry for that information. It is something that appeals to her senses, not an inert object. Someone (you??) are chopping carrots, one fell on the floor, the dog is curious. Patience is – overrated. Dog is learning to wait. I see a dog, a shadow of a person taking the picture. The object on the floor is round and it look mades of plastic, like the dog was going to get it or afraid of it. I see dropped food like a carrot? Dog can’t decide if he wants it or not. Is thinking is it cheese, or a button? Not much odor. Dog is timid maybe a high chair and baby are close. I hear sniff and the thought “what?” I get a royalty name of some sort. I feel something about a fridge like put it in the fridge. I got cheese cracker and the name Sam. The dog is looking at a button on the ground, but won’t go any further. There is an image of a round face then a male guardian protecting from a dark entity in the bottom right hand corner. The dog is feeling fearful. The dog is looking at a pill that he is supposed to take. He is sick, and has mixed feelings about the medication and his life here on earth. I saw the little (food) item moving! The dog is watching in fascination and a bit of confusion. There is an insect underneath it carrying it across the floor. I felt happiness in seeing the dog go for the treat on the floor! I see a bug. The dog is interested and confused. Beautiful big dog. First I saw his shadow…ear especially….then the actual dog. Very well behaved but he wonders what that is on the floor. Bella? He likes to kick this peg around on the floor and then chase after it. Dog contemplating if he’s allowed to take the sweet or not. The dog is looking at a treat on the floor but there are two spirit cats around the treat! I see a chocolate lab going after whatever that is on the floor. Looks like candy or a checker, but I can sense that the dog is picturing a heart. Like a Valentine. This dog is feeling much love for the people in the house or room. I see a big red heart, and he wants his people to know how precious they are. happiness curiosity came off the kitchen table in the morning light in the kitchen…Danielle and husband in the room…playing a game, laughter…make believe…gay…travel. Curious family pet..black lab in front of frig where food has been known to fall.is it cheese he wonders? Ahwaz shucks its a button. He,spit it and stamps at it playfully…knowing it was a joke. Awe, a little carrot treat. Two for your salad and one for me! Doggie is riveted by an orange-flavored tablet that fizzes up in water. Only it’s on the floor, fizzing away! I feel this is a game for the dog. He seems to be waiting patiently until his master tells him to go after it. Saw curiosity and wonder. If the curious item were big the dog would be afraid. Overall: Curious of unknown items if smaller than us afraid if larger. It’s a cheese cracker. He wants it but feels his owner nearby and isn’t sure if it is ok to go ahead and have it. …but he might just go ahead and lick it up quickly. The scent is irresistible! older dog, spinning button, or a button popped off, laughing & having fun.